A step up from administrative assistant, an executive assistant (otherwise known as an executive administrative assistant) is often the executive’s right hand, who is tasked with higher level responsibilities that allow the executive to better carry out his or her job without wasting his time working out the details. Because of this, the cover letter for an executive assistant needs to be clear in articulating how you can be an invaluable asset to your boss. You need to show that you can do it all and do it well, and the best way to to do that is to learn how to craft a strong cover letter that will make your employer eager to bring you onboard. My name is [Your Name] and I’m glad for the opportunity to apply for the executive assistant job at [Company Name]. Not only have I accumulated over four years of experience in administrative support, but I am also a huge fan of the artists under your management. When I saw that [Company Name] was searching for an executive assistant, I jumped to apply because of the invaluable opportunity to work in an innovative environment, where I am sure to develop as a professional. At Waxpax Inc, I handled tasks as diverse as managing partner agendas to coordinating communication between the executive, partners, and employees. While at the company, I became the trusted right-hand woman to the executive and protected company interests by upholding confidentiality standards and making tough decisions when the executive was indisposed. The tasks assigned to me required quick reaction and turnaround time, innate problem solving skills, and strong organizational skills. Furthermore, while at Green Leaf Financial, I was an indispensable member of the team. I planned the company’s travel calendar, cutting back travel expenses by 14%. I also managed the appointment calendar, wrote confidential correspondence, filed expense reports, and organized company parties to boost morale. All of these were important duties that display my money-savvy know-how, attention to detail, and people skills. or by email at [email protected] Thank you for your consideration, and I look forward to meeting you soon. Before you submit your application to become the executive’s most trusted confidante, take a look at these pointers on how to impress him or her right off the bat. Finding a connection with the company is crucial because as executive assistant, you will be entrusted with tasks that are pivotal to the operations of the company, such as making major decisions on behalf of the executive. When seeking an executive assistant role, you should demonstrate that you have a sincere desire to work for the company. Do you admire what the company does? Do you like the company culture? Does the company’s goals match your own? Finding a connection with the company is crucial because as executive assistant, you will be entrusted with tasks that are pivotal to the operations of the company, such as making major decisions on behalf of the executive. Therefore, exhibiting some kind of personal attachment to the company and working that into your cover letter will increase your chances. Not only is she already familiar with the company, but she also articulates that she is attracted to the company’s work culture. Both these points signifies to the employer that you’re genuinely interested in joining his or her team and not just any company that will throw you a job. An executive assistant has to be able to handle any of the tasks thrown at him or her. Depending on the delegating style of your executive, he or she may be asked to do everything from handling confidential communications to organizing company trips to managing people. 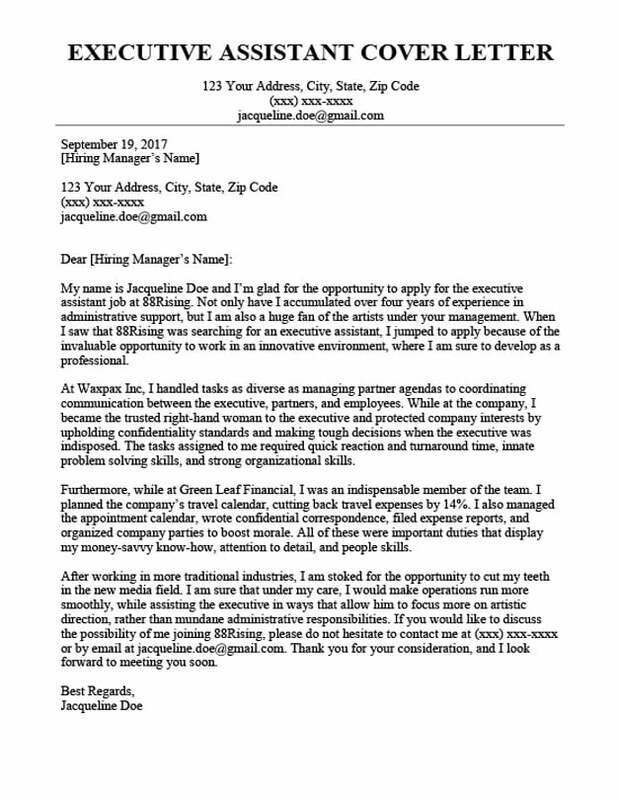 The best executive assistant cover letter will use the applicant’s experience to show that he or she has the skills to take care of everything. While at my previous place of work, I was an indispensable member of the team. Not only did I plan the company’s travel calendar, but I also cut back travel expenses. However, without numbers to back him or her up, it doesn’t make as strong of a case. Because the statement is so vague, the hiring manager won’t know how effective you really were at your previous job, even if you were indispensable. Furthermore, while at Green Leaf Financial, I was an indispensable member of the team. I planned the company’s travel calendar, cutting back travel expenses by 14%. By directly stating that travel expenses were cut back by 14%, the hiring manager knows immediately the magnitude of your efforts, making it ironclad proof that you are qualified to take on the job. The best way to illustrate your expertise effectively is to use quantifiable data whenever possible so that your employer can immediately draw conclusions about your competency from the concrete evidence in your cover letter. Before you submit your application materials, triple check everything and ask a third party to proofread your work. One of the easiest ways to put yourself out of the running is to make silly spelling and grammar mistakes in your executive assistant cover letter. Since attention to detail is such an important aspect to the duties of an executive assistant, a spelling or grammar snafu in your cover letter can be taken as an indication that it’s a skill you lack. 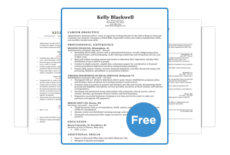 The cover letter is your chance to make a great first impression, so don’t trip yourself up on your first step! Before you submit your application materials, triple check everything and ask a third party to proofread your work. You never know what a fresh set of eyes might catch, so you can never be too careful. After perusing our tips and sample cover letter for an executive assistant job, you should be on your way to showcasing yourself as the perfect right hand man or woman for your boss. However, if you’re having doubts about the efficacy of your cover letter, use our builder to create a cover letter that’s sure to impress.